Winter is finally over, and the long, warm days of spring are here to stay. As you spend more time outdoors this season, propane is an excellent fuel for transforming your backyard into a comfortable outdoor living space for friends and family. You may think propane can only be used for powering your grill, but this clean and efficient fuel source has a variety of outdoor applications that will make your backyard the place to be this season! Below, we share four of our favorite outdoor applications for propane. The American Society of Landscape Architects reports that outdoor fireplaces and firepits are the most popular outdoor landscape design feature requested by clients, and we aren’t surprised! An outdoor fire pit provides a wonderful place for groups to gather and make memories on a warm spring evening. Building a traditional fire can be time-consuming and quite messy with smoke, soot, and ash. However propane-powered fire pits and fireplaces provide the warmth and ambiance of a real flame with the convenience of an on-and-off switch—allowing you to enjoy more time with friends and family. As the weather warms up you will be ready to get outside and enjoy your swimming pool or hot tub. However, with unpredictable spring temperatures, a consistent and affordable heating source is essential! Propane is an excellent choice for heating outdoor pools and spas and has been shown to be more effective and efficient than electric options. Who doesn’t love a little bit of springtime ambiance when spending time in the backyard? Whether you are hosting a family dinner, a fun-filled game night with friends, or enjoying some relaxing alone time in your outdoor space, flame-lit lighting options will add an extra cozy feel to your yard. Propane is an easy and affordable way to power outdoor lights – and, as a bonus, they will work during power outages. When it comes to outdoor cooking, propane can fuel a lot more than just your standard grill! 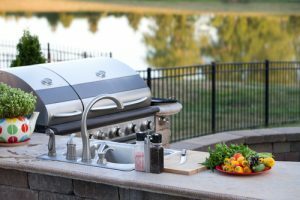 If you love to cook outdoors and are considering an outdoor kitchen space for entertaining, propane is an affordable and efficient alternative to running new gas lines. Opting for propane-powered appliances also allows you flexibility while setting up your outdoor cooking space, instead of forcing you to depend on electrical outlets as you design. If you are ready to get outdoors and enjoy your backyard after a long winter, you may want to consider some of these applications of propane. Whether you want to power a fire pit or fireplace, heat a pool or spa, power decorative lighting, or fuel an outdoor kitchen space, our residential propane services have you covered. If you are interested in learning more, contact us at 800-850-4380. We have propane service locations in Princeton, Dale, Evansville, Elkton, Livermore, Henderson, and Bicknell.